"The group was planning a number of high-profile terrorist attacks in the Moscow region," - said FSB representative. The terrorists were plotting attacks in Moscow region. 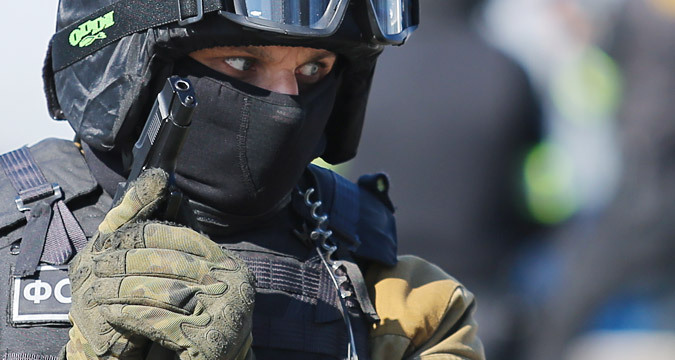 The Russian Federal Security Service (FSB) detained seven members of Islamic State terrorist group cell in Dagestan, Russia. The activities of the covert cell have been thwarted in Russia’s North Caucasus Republic of Dagestan, seven people have been detained, the Public Relations Center of the Russian Federal Security Service said on Dec. 29. "FSB employees in collaboration with the Russian Interior Ministry have thwarted the activities of an undercover group of supporters of the Islamic State international terrorist organization (outlawed in Russia) in Dagestan. The group was planning a number of high-profile terrorist attacks in the Moscow region," said an FSB representative. "The gunmen were planning terror attacks on direct instructions from the IS emissary based in Syria," said the representative. "Seven people have been apprehended after investigative operations. Large amounts of firearms, hand grenades and ammunition as well as components of improvised explosive devices have been seized during the searches in their houses," the Public Relations Center added. Investigative activities are currently underway.